We need to face the truth rockers. 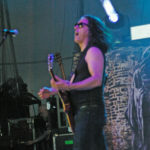 The bands that set the standards for rock and metal are getting older and time stops for no one. 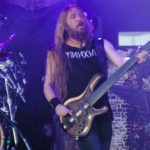 Real final tours are going to start becoming the normal but I doubt there will be one like the Slayer Final Tour. 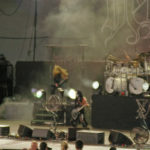 Not just because it’s Slayer but because they brought with them Testament, Behemoth, Anthrax, and Lamb Of God essentially making it THE METAL tour of the year. Did it live up to that, in a way yes. Testament was first at bat. 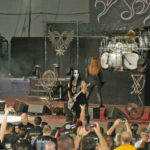 They managed to do an amazing mix of their catalog in just a very brief 35-minute set. Shockingly short since local bands who open on national tours usually get 40-45 minutes. 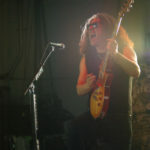 But Chuck Billy, Alex Skolnick, and the gang didn’t care. 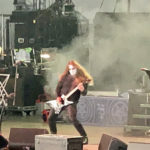 They made that brief set theirs kicking things off with “Brotherhood of The Snake” while also hitting a classic with “Into The Pit” despite there being no pit but all seats at PNC Bank Arts Center. My only problem aside from the short set was that the sound was a bit muffled. 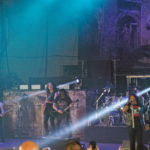 Chuck Billy’s vocals were tough to make out and it was also hard to understand him when he just talked to the crowd a bit. Despite a great set and energy they brought it was lost the being the first band up for the sound crew to setup for. 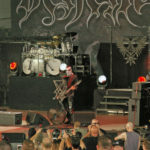 Next up was Behemoth whom I was very curious to see live as I’d never seen them before. Sadly they also fell victim to a 35-minute set time and poor sound quality. Everything was muffled and muddy and sounded the same which I know is not what Behemoth sounds like from the few songs I’ve heard. What kept me interested was their stage presence. For second band up with a brief set they brought their top stage setup and I really like their makeup and stage outfits. 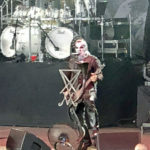 Behemoth truly are a reminder that a live performance is as much about your appearance and look as it is about the music sounding good. 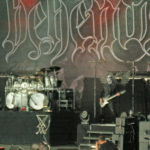 I’m definitely going to fire up the BluRay copy of Messe Noir: Live Satanist that I received recently so that I can get a better knowledge of their live performance and will definitely see them again live in the future if I can and hopefully as a headline act so they get better sound. At this point I was getting concerned. 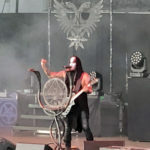 Two bands down with three to go and the sound quality was not what it should’ve been for Testament and Behemoth. Had the sound continued to be questionable the crowd would’ve definitely been dissatisfied. 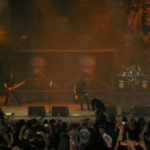 But once Anthrax hit the stage with “Caught In A Mosh” my sound concerns were put to rest. Frank Bello and Scott Ian coming through as if I just pressed play on the CD and Joey Belladonna continuing to blow my mind with his vocals. 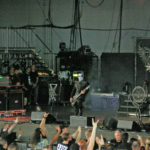 I’ve lost track of how often I’ve seen Anthrax live since The Big 4 at Yankee Stadium and NOT ONCE has he been off. They rolled through a 40-minute set like a freight train. No bullshitting, just pure hard hitting nonstop thrash. Unfortunately for the fans we weren’t privileged to get the full Anthrax of recent years since Charlie Benante is once again sidelined by Carpel Tunnel Syndrome. 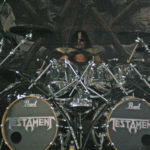 While his unique style was missed, Gene Hoglan of Testament filled in perfectly considering he had just done a great set with Testament. 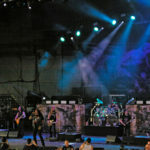 Even though Anthrax plowed through their set because the whole tour was stacked their set still seemed short. 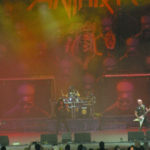 Don’t get me wrong because a 40 minute set is far from short but for Anthrax it just felt shorter. 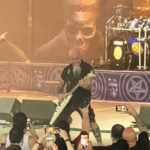 Perhaps because they stuck with the Kings Among Scotland setlist which focuses on Among The Living with “Evil Twin” being the only newer song in the set. 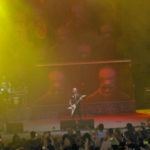 The audience definitely wanted more Anthrax but I think it just set the pace for the rest of the evening. 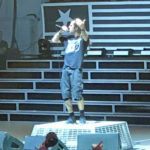 Lamb Of God took the energy Anthrax left on the stage and came out swinging big with a one-two punch on “Omerta” and “Ruin”. 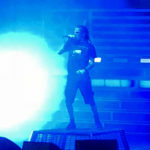 Randy Blythe growling and taking over the stage as if he were a lion let loose upon the Savannah making the stage and crowd the property of Lamb Of God for their 50-minute set. Their set rolled on as Charlie Adler and John Campbell set the pace for “Walk With Me In Hell” thus getting the venue rattling to the point where I’d bet they felt it on the nearby Garden State Parkway which could’ve easily been renamed Route “512” as they kicked things into overdrive. 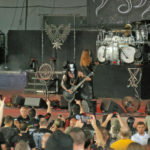 Their set ended perfectly with “Redneck” which left everyone including myself with a sore neck with Slayer still to come. 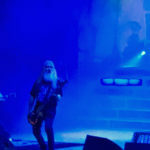 At this point the curtain dropped as the crew rushed to set to stage giving everyone one last chance to hit the bathroom or get a refill of their beverage of choice before they saw a band that has been a staple in the metal community for 37 years for their last time. 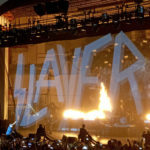 As I waited I began thinking how many, including myself, have said that Slayer hadn’t been the same since Dave Lombardo left and the passing of Jeff Hanneman in 2013. 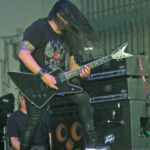 But Gary Holt stepped up for Hanneman before his death due to illness from necrotizing fasciitis and has done an amazing job. Fitting seamlessly into some very big shoes. But you’ll always have the purists that long for original lineups forgetting that things in life change but at least in music you can revisit the lineup you love with the albums. 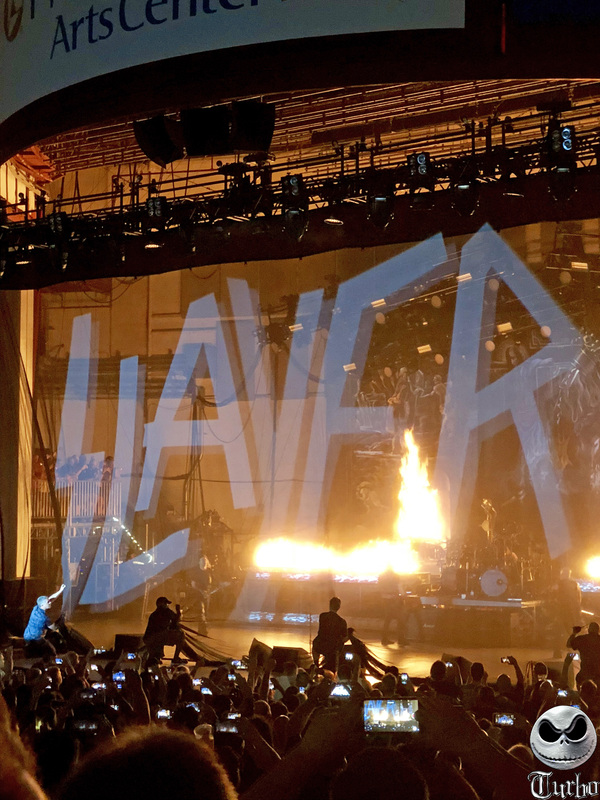 Next thing I knew “Delusions Of Saviour” was blasting through the venue with the crosses slowly being inverted on the curtain followed by the roar of the crowd as the word Slayer hit the curtain with fire and flames visible through the curtain. Then the curtain drops with “Repentless” coming right at us at full blast. And none of us would have it any other way. 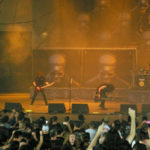 The break their set down song by song would be unfair as each song hit with the full energy that many known Slayer to bring. 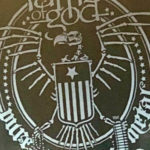 “Mandatory Suicide”, “War Eternal”, “Postmortem”, and so many more were musically at their peaks. 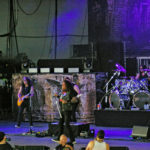 And I say musically because at one point Tom Araya actually admitted he forgot where he was and the lyrics for a song. While it does happen for all bands from time to time, especially one that’s been going for 37 years but it took a bit away from the rest of the show. I found myself wondering is that why Slayer is calling it a day? Has it become mundane for them? And I was now listening for more mistakes. Granted they didn’t come but it would’ve been better left unsaid. 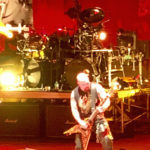 When the classics began to hit we knew it was nearing the end of Slayer’s last show in Jersey. 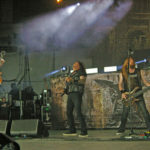 The band gave it their fullest through “Seasons of the Abyss”, “Hell Awaits”, “South Of Heaven”, and of course “Raining Blood” and the fans gave the energy right back to the band. Everyone creating an energy that I’m sure was felt miles away. And just like that it was done. 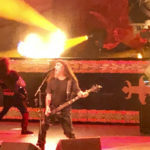 Slayer took their bows and the packed PNC Bank Arts Center thanked them for 37 years of reigning big in the world of metal. It’ll probably be several years before you see a tour as packed as this. 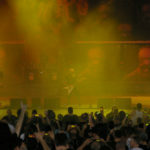 But one thing is certain, since Slayer is the first of The Big 4 to say goodbye they set a very high bar for the remaining bands to keep until they choose to retire.